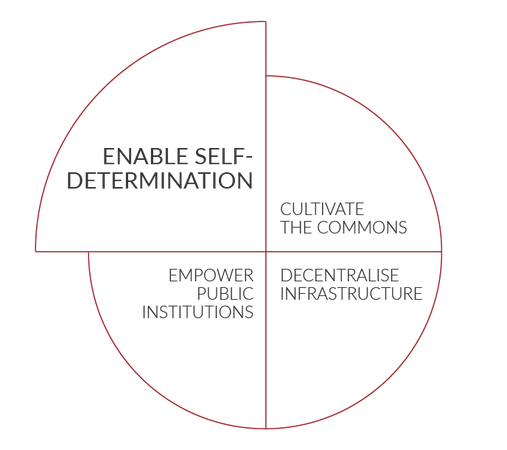 Self-determination in the digital environment refers to the right to privacy and the need for more democratic models of data governance and algorithmic transparency. The call for self-determination in the digital environment is a reaction to the growing market power of a handful of platform providers who increasingly control the digital space. It is also a call for using digital tools to support sovereignty at community, municipal and regional levels. Technology should serve the common good and support broad citizen participation, instead of solely aiming for purely commercial objectives and outcomes. We need to regain control over ourselves within the digital space, not only individually, but also collectively. This relates to self-determination, choice and control of individuals, communities and Europe as a whole. People deserve to have a say in the way their digital environment functions, hence we need participatory shaping and governance of this environment. While states were the most powerful entities throughout most of history, that is certainly not the case anymore. Today major tech companies, most of which have built their business on the free use of personal and other data, are bigger and more powerful than many nation states, although their forms of wielding power are different from the traditional force of a nation state. Our daily lives are impacted by a globalised market in which such commercial entities are exceptionally wealthy and powerful. We not only use their products and services, but, especially within the digital space, share data about ourselves in exchange for free or discounted use of these products and services. Once we do that, we often lose control over what happens with this information. Data-driven corporations extract value from users, and process, trade , and commercialise this information to maximise profit. Within this process, data is used to manipulate users and to further increase the consumption of products. At the level of individuals, this translates into challenges with regard to users’ personal data and privacy. At the level of the society, this becomes an issue of a market capture of data as a resource that is being produced. This resource is shaping our education, our housing, our transport, our environments, as well as our identities, according to commercial interests without any democratic debate on the direction taken. Citizens have no agency in this process, and lack control. The moment users engage in online activities, they have to provide their data to online platforms. They cannot choose whether they actually want to do this (outside of simply not using the product/service), nor can they in practice set conditions on how their data will be used. Yet, the lack of control over data is not just an in issue with regard to commercial products and services. The public sector is increasingly relying on data analysis and algorithmic decision-making within, for example, healthcare and social services, education or the judicial system. There is a growing body of examples of detrimental effects from this type of automated decision-making on people in marginalised positions - and algorithmic bias can ultimately adversely affect all citizens. By calling for self-determination in the digital environment we ask for something more fundamental than the individual legal right to privacy. It must be possible to fully participate in (online) social life without having to give up your (personal) data to commercial entities. The role of data and how it is used in surveilling and influencing users needs to be made transparent to the general public, and users need to have meaningful opportunities to minimise data collection, and control its use. Yet, self-determination cannot be achieved by only thinking about protecting privacy in terms of individual rights. We need to rethink privacy as a public good, because the increasing use of personal data by tech companies and governments is not only impacting the individual, but has larger societal consequences. More broadly speaking, there is need for democratization of data governance aimed at improving and tightening our standards with respect to personal data extraction and processing. We need more robust oversight of these practices. In this context we also see self-determination relating to solidarity. Solidarity in terms of not leaving everything to the individual but facing these challenges of the digital transformation as a collective. Collectively and in solidarity with each other we can set standards for a society that is democratic and where citizens are protected from commodification, privacy intrusion and surveillance. We should collectively work to realise a digital environment that instead facilitates self realisation, creativity and diversity. Judith Blijden is a lawyer and legal philosopher. As a copyright and digital culture advisor at Kennisland / Communia until December 2018, she focussed on improving the EU copyright framework. More posts by Judith Blijden.